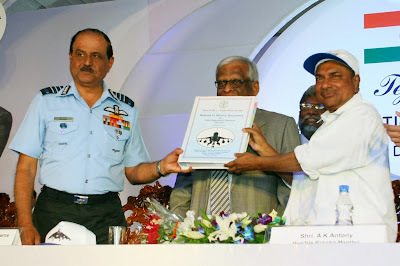 The Defence Minister Shri AK Antony today handed over the Release to Service Certificate of the country’s own Light Combat Aircraft (LCA), Tejas, to the Chief of Air Staff Air Chief Marshal NAK Browne, at a function in Bengaluru, marking the fruition of a long and difficult journey of three decades of efforts to make a fighter aircraft of international standards. 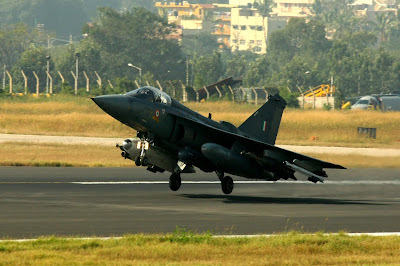 Described as Initial Operational Clearance-II of Tejas, the LCA is designed to ultimately replace the Mig 21 fleet of IAF. The timing of IOC- II for LCA coincides with the iconic Mig 21 FL fighter flying into IAF’s history just a week ago. Visibly happy at today’s event, Shri Antony said, during the last three years, the capabilities of the aircraft have been improved significantly. “In recognition of the enhanced capabilities, IAF has decided to grant the aircraft a higher status, namely, the Initial Operational Clearance for induction into the Service”, he said. Shri Antony candidly confessed that he had his share of anxieties regarding the future of LCA when he had taken over as the Defence Minister in 2006 but today we are putting behind the moments of self –doubt, frustrations and setbacks which we as a nation have gone through in the last 30 years. “The improvements to the aircraft have enhanced the flight envelope of the aircraft and also weapon delivery capability of the aircraft. The performance at Iron Fist, Jaisalmer and the recent missile firing at Goa are examples of such improvements. The reliability of the aircraft and serviceability has also been enhanced. The number of flights nearing 500 within this year provides an indication of this. 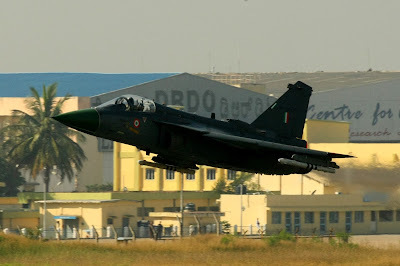 Operating at IAF bases namely, Jamnagar, Jaisalmer, Uttarlai, Gwaliar, Goa, Leh, Pathankot demonstrate the aircraft capability to operate from Air Force bases. There have also been occasions when the same aircraft has flown thrice on the same day, indicating the operational reliability of this home-bred fighter aircraft ”, he said. Shri Antony said military aviation in the country has got a major boost with the approval of several new programmes. Some of these programmes include – Mk2 variants of Navy and Air Force; Advanced Medium Combat Aircraft; Unmanned Air Systems; Fifth Generation Fighter Aircraft and Medium Transport Aircraft, to name a few. Describing the attainment of Initial Operational Clearance as an important milestone in the long journey towards indigenization through self-reliance, Shri Antony said, our public and private sector must work in tandem to develop and produce world-class military systems of the highest quality. The Chief of Air Staff Air Chief Marshal NAK Browne said it is indeed a proud day for the nation and particularly for the IAF; since the grant of IOC acknowledges the capabilities of this aircraft and paves the way for the induction of LCA Mk 1 into operational service. He said the progress of such a challenging experimental project without any accident or major incident is unprecedented in the history of aviation. 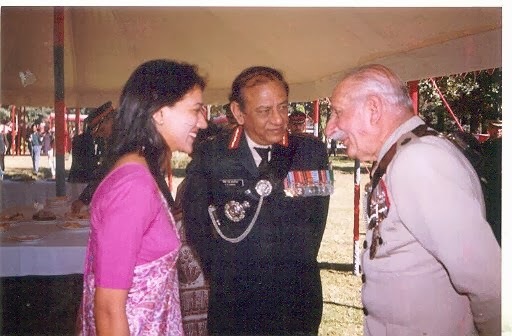 On a personal note, ACM Browne said as he prepares to hang his uniform at the end of this month, he would have gone home as a disappointed person if the IOC of the LCA had not been achieved. Today’s event was attended among others by the Scientific Advisor to RM Shri Avinash Chander, Secretary Defence Production Shri GC Pati, Chairman of HAL Shri RK Tyagi, Programme Director of ADA Shri PS Subramanyam, DG- Aero and CE CEMILAC Dr K Tamil Mani. The Country had embarked on an ambitious plan to indigenously design and develop the Light Combat aircraft (LCA) to be inducted into IAF and Indian Navy inventory. The Programme has been spearheaded by the Aeronautical Development Agency (ADA), Bangalore under the Department of Defence R & D, with Hindustan Aeronautics Limited (HAL) as its principal partner. A large number of Laboratories of Defence Research & Development Organisation (DRDO) and Central Scientific & Industrial Research (CSIR), certification agencies, Indian Air Force, academic institutions and Private/Public Sector Undertakings participated in the LCA development effort. Indian Light Combat Aircraft, christened ‘Tejas’, is the smallest, light weight, single engine, single seat, supersonic, multirole, combat aircraft and is one of the best in its class in the world. The quadruplex digital fly-by-wire flight control system ensures acceptable handling qualities while ensuring adequate safety throughout the flight envelope. The advanced Glass cockpit open architecture system complements piloting. Four variants of Tejas aircraft (Combat variant, Trainer and Naval variants) are being developed for land and carrier borne operations. The Initial Operational Clearance-1 (IOC-I) for ‘Tejas’ was achieved on 10 Jan 2011. In IOC-I, the Aircraft had a few limitations in terms of Combat performance, turn around time and its weaponisation which had to be refined and improved through Research & Development process. In addition to this, Wake penetration trials, all weather clearances were planned beyond IOC-1. Since IOC-1, ‘Tejas’ has accomplished significant milestones. 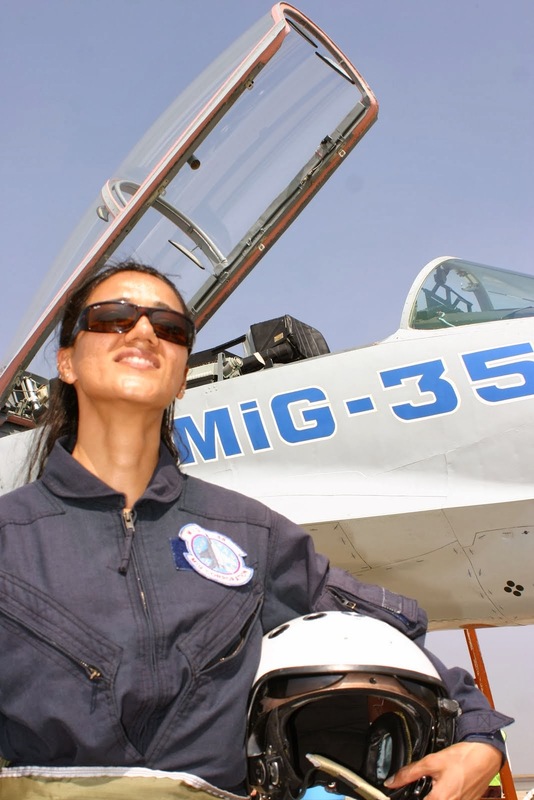 Till date, more than 2450 sorties have been completed to achieve the flight test goals towards IOC-2. The design issues were resolved with System Engineering approach and by periodical reviews with participation of external experts. The salient features which have been achieved in IOC-2 include Safe flying up to High angle of Attack as mandated by the users. 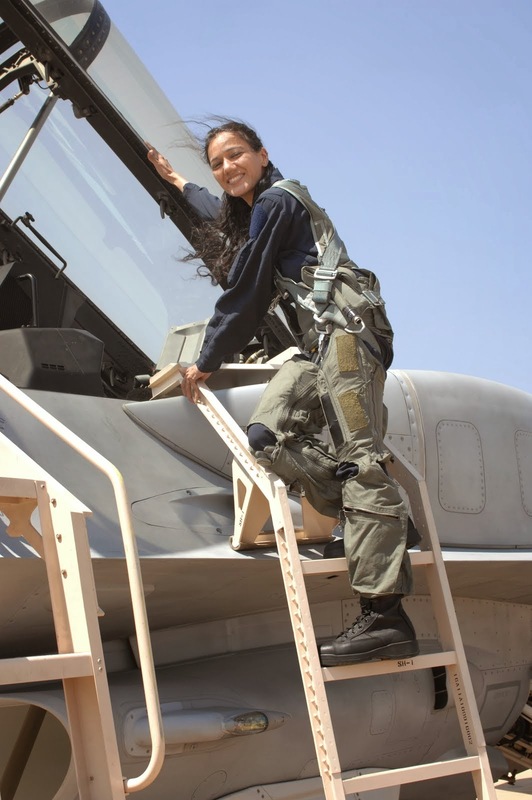 This has considerably enhanced the combat performance of the aircraft. The Flight control system evaluation has also been completed. The time for initial built-in test has been reduced considerably which enables faster turn around and enhanced operational readiness of aircraft. The Brake system has been improved significantly in terms of energy absorption capability during landing, thus ensuring prompt turn-around of the aircraft. Significant improvement in Cockpit ergonomic and lighting system has been accomplished for improved night flying. In-flight re-light capability was demonstrated to ensure enhanced safety and reliability of the aircraft. This is a major achievement. 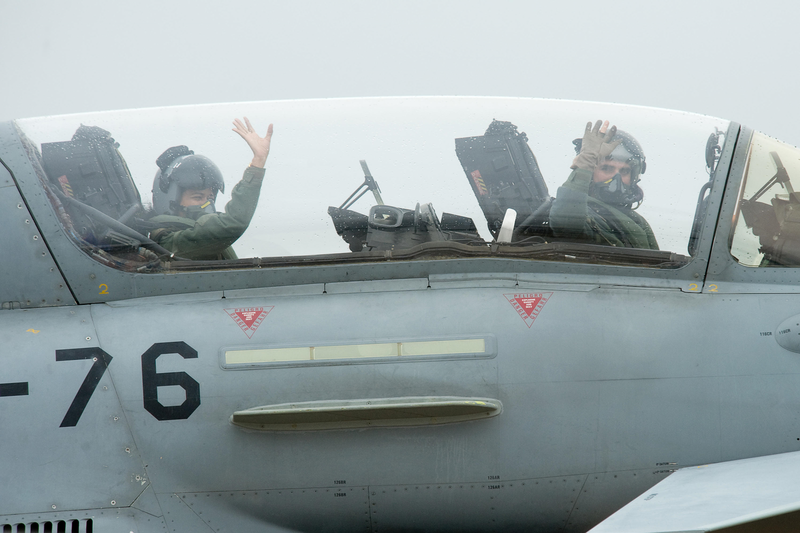 Avionics and Weapon system of the aircraft have been revamped for effective mission superiority. 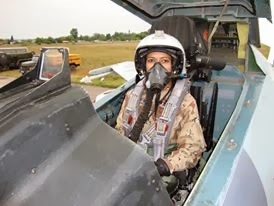 Helmet Mounted Display Sight (HMDS) has been fully integrated in Tejas and R73E missile firing has been successfully demonstrated using HMDS. 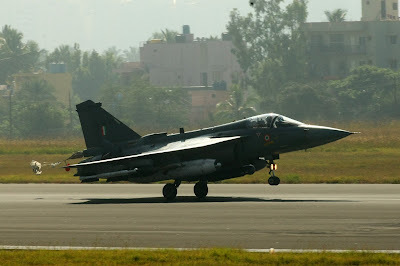 Multi Mode Weapon multirole capability of Tejas was demonstrated during its participation in Iron Fist. Air to Ground mission and Air to Air missions were demonstrated by dropping Laser Guided Bombs and R73E firing in single pass. Laser Guided Bomb firing has been achieved for IOC-2 to user’s satisfaction. Aircraft readiness for missions in terms of its readiness and Operational Readiness Platform (ORP) and Turn Round Service (TRS) and easier maintainability has been achieved as per requirement thus enhancing operational readiness of the aircraft. Tejas has passed all the tests for “All Weather Clearance” of the aircraft. The Aircraft has been cleared for fly without any telemetry support. IOC-2 shall enable Air Force to carry out air superiority and offensive air support missions, forward air field operations, all weather multi role operations, Electronic counter measures and night flying operations. LCA Tejas is capable of flying non- stop to destinations over 1700 km away (Ferry Range). It's Radius of Action is upto 500 km depending upon the nature and duration of actual combat. LCA is powered by the F404/IN20- a well proven turbofan engine, designed and manufactured by General Electric Aircraft Engines, USA. The Engine is modular in construction, consisting of six modules, ensuring easy maintenance. The F404-GE-IN20 is a low bypass turbofan engine, with augmented thrust provided by the afterburner. The production facilities have been set up at HAL and the aircraft delivery is expected to commence from 2014. “We have plans to initially produce eight aircraft per year. Further plans are afoot to enhance the production rate to 16 aircraft per year in consultation with IAF and MoD. HAL is fully geared up to meet the challenging production schedule and hopes to fulfil the requirements of customers in a time bound manner”, says the Chairman, HAL, Dr RK Tyagi. After the achievement of IOC II, HAL will go ahead with the Series Production of LCA Tejas. The Company has already established the structural assembly hangar and the assembly jigs have been calibrated with state of the Laser Trackers to an accuracy of 80 microns (0.08 mm) to meet stringent quality standards. A state of the art CNC drilling machine has been installed to ensure repeatability and reduce the cycle time.